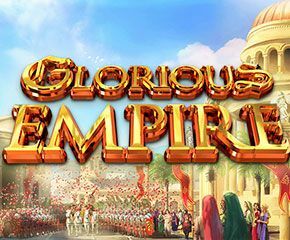 NYX gaming is the developer of the spectacular Glorious empire slots. Famous for their stunning graphics and impressive gameplay NYX gaming has done a beautiful job in creating this game. NYX gaming maintains their reputation as one of the biggest game developers in the world. 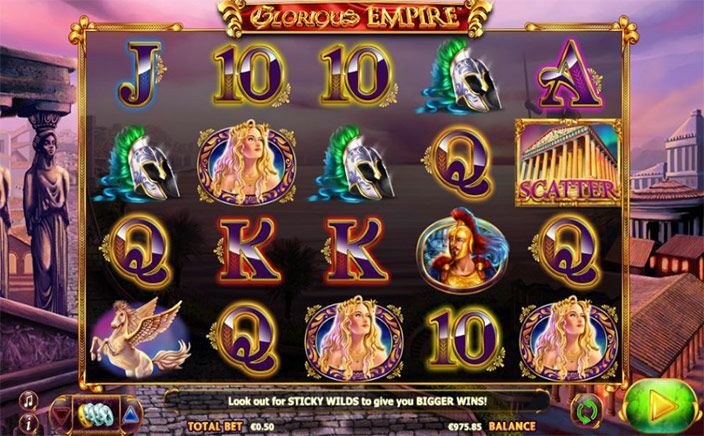 As you open the Glorious empire slot page, you are greeted with some striking graphics and a 5-reel video slot. On the side is a triangular bitten that has to be pressed in order to spin, and on the above is a bar that shows your balance, the bidding amount and the amount you have won. The spin bet can be adjusted by clicking on the arrows with £0.50 being the least and £1250 being the highest bet. Each time you spin, exhilarating music plays in the background and your win is shown in a small box at the bottom of the slot. The combinations are made from both sides, this is the‘pay both way’ feature where your wins can attack from left to right and from right to left. The other prominent features are ‘scatters’, these are pictures of a Roman building. If you are lucky enough to land 3 to 5 scatters in one spin you get various bonuses like free spins, 4000x your points etc. Apart from this there is a ‘wild golden lion symbol’ this can be used as any symbol to make combinations. If you land a total 5 of the wild lions in one spin you can win up to 250x of your bet. Glorious empire gives you many beautiful symbols like the winged horse, Roman knights, chariot, Roman princess, helmets etc that are also rewarding if you make winning combinations. Stunning graphics, appealing music, great features and exciting gameplay makes it worth playing. Even though it does not have a very high payout, it still gives the player a fair amount of opportunities to make big bucks. All in all it is an ideal choice for people interested in historical themed games.